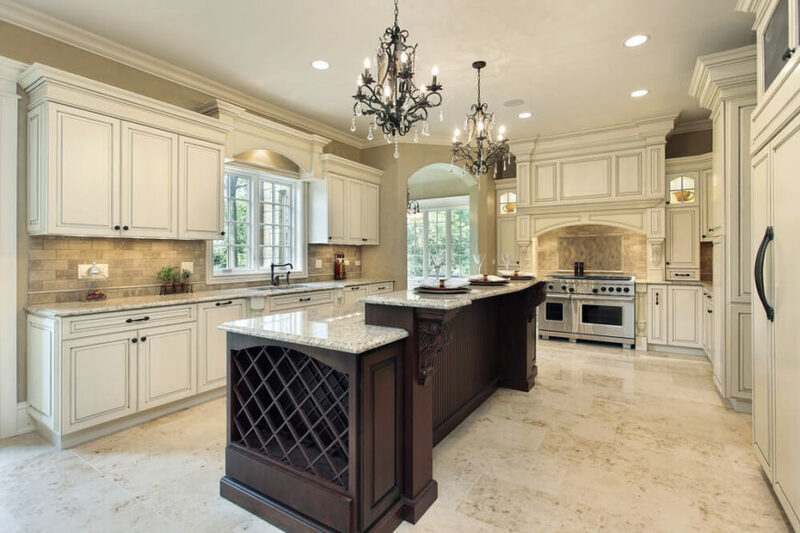 Welcome to our huge kitchen island ideas page where we showcase all kinds of kitchen island styles – big islands, small islands, rectangular, square, curved, dark, light or for working space or a place for small appliances such as coffee makers, microwaves, toasters, etc. Since 75% of today’s kitchens have an island, kitchen island design is an important consideration. 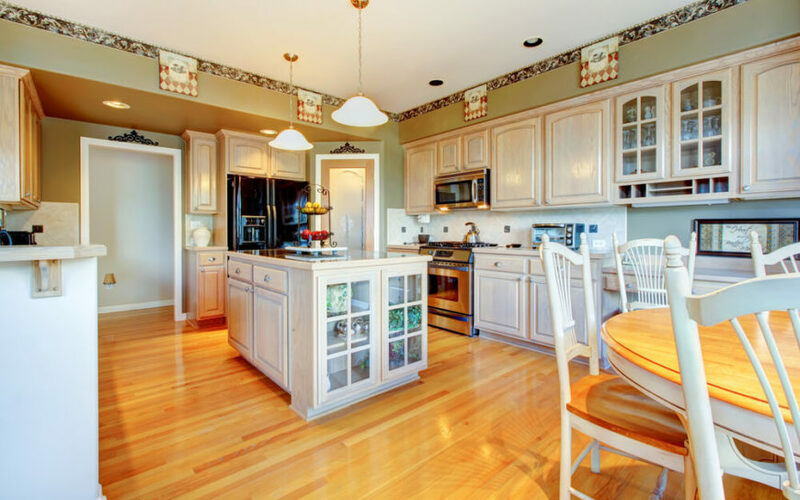 Browse our photos or narrow your search with the many kitchen search options. Designed by Audax. Stunning island with built curved bench seating and dining area. The bench is metallic blue against medium tone wood. The island surface is gray. The overall kitchen scheme is natural wood, blue and gray. Large u-shaped white island with breakfast bar. See the entire home here. Light grey island with dining seating features black countertop and full kitchen sink. Lush beige tones throughout this kitchen, including filigreed wood island with rounded marble countertop. Minimalist dark wood paneling throughout this kitchen with triangular matching island featuring expanse of white glossy countertop. A kitchen of contrasts holds this large island in black and white, replete with expansive built-in storage and full island range. Kitchen island photo of a luxurious beige tone island features wide overhang for dining, with built-in range. This compact island in white features two-tiered natural wood countertop with plenty of dining space and hood vent with extra shelving overhead. Large island doubling as dining table, with large overhang and carved wood legs. Light marble countertop matches with kitchen while white wood paneling adds contrast. Dark wood and marble countertop island stands out in this white and beige kitchen, with ample dining seating all around. 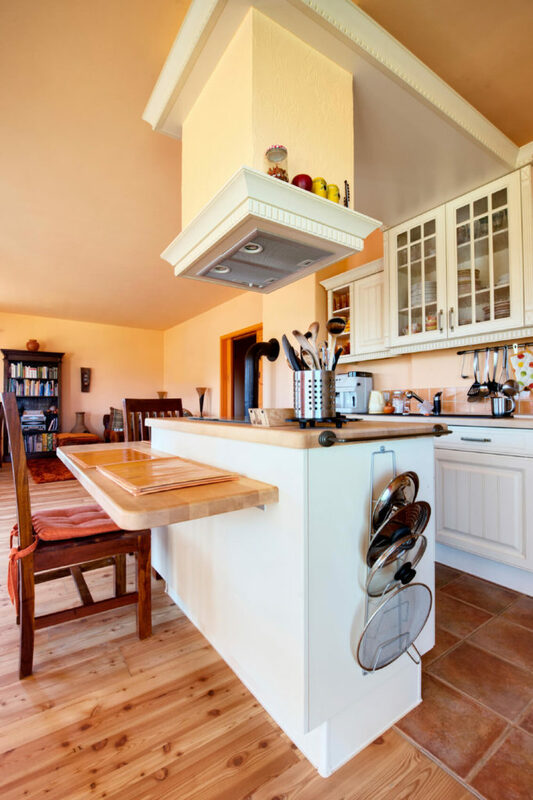 This is a great example of a natural wood kitchen in an otherwise white kitchen. Unique, white-toned island stands apart in this black-floored kitchen, with light wood tones and white marble countertop and side panels. Rich, natural wood kitchen holds this large, contrasting light wood island at center, with built-in dishwasher, storage, and sink, across from dining seating. Warm wood tones unify this kitchen featuring large island with ample seating area, built-in shelving and full kitchen sink. This is clearly not your typical DIY kitchen island. Instead it’s a luxury custom design in a large, open kitchen features immense island done in natural wood tones, with built-in glass cabinetry, dining area, and full sink on marble countertop. White island with rosy marble countertop under dual chandeliers stands apart in this natural wood toned kitchen. Here we have another two-tiered island adding contrast to a kitchen with warm natural wood and dark marble countertop. Compared to others in this gallery, this is an example of a smaller kitchen island. Red wood features heavily in this kitchen, contrasting with light beige tile flooring and countertops. 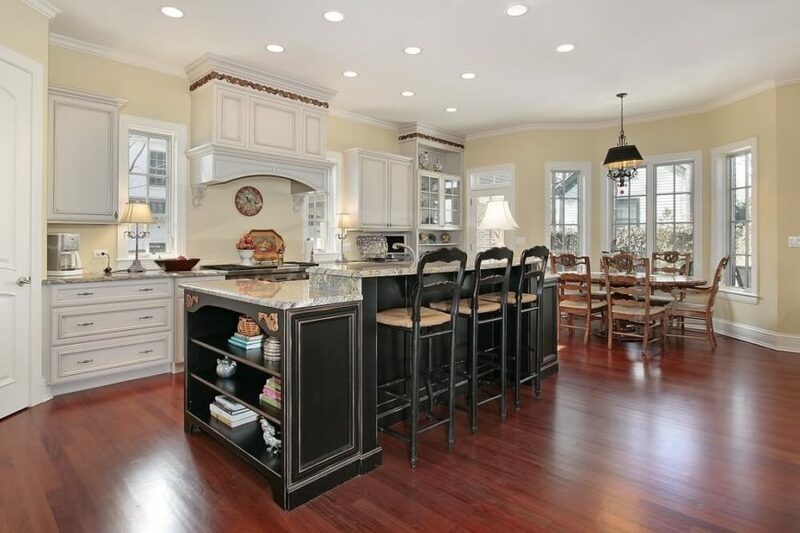 Elaborate, multi-tiered island has built-in bread box and ample dining space. Below is our extensive write up on the different types of kitchen islands followed by a terrific gallery 30 different examples. When it comes down to it, there are unlimited options for designing a kitchen island. That said, if you go with a pre-built, your options are less, but obviously, it will cost much, much less. Some kitchen islands, especially many in this gallery cost thousands of dollars. 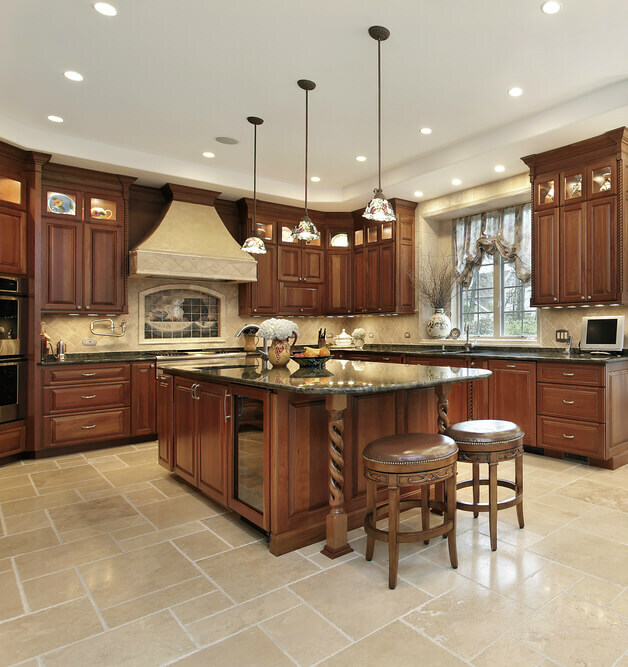 Custom design: Many people are choosing to put luxury kitchens in their homes these days. It’s often the most expensive room. Off the shelf: Many hardware stores offer “off-the-shelf” kitchen islands along with cabinets. This is much less expensive and can be an excellent option for your kitchen. Please don’t think you need a custom luxury island for it to look great and be functional. 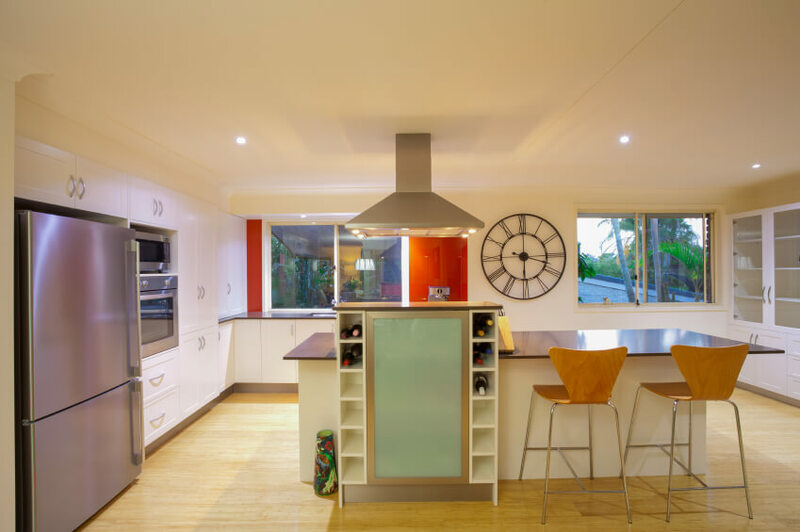 An inexpensive island can definitely improve kitchen function and appearance. Mobile kitchen island: You can also buy mobile kitchen islands on wheels. These are usually fairly small and are a terrific addition to smaller kitchen spaces. Butcher block: For an even less expensive and smaller option, consider a butcher block. We have one and while we don’t use it as an Island currently, it’s always a handy item for more workspace and/or storage. Same color as cabinets: This is a common design element – matching the island with the other cabinets throughout the kitchen. 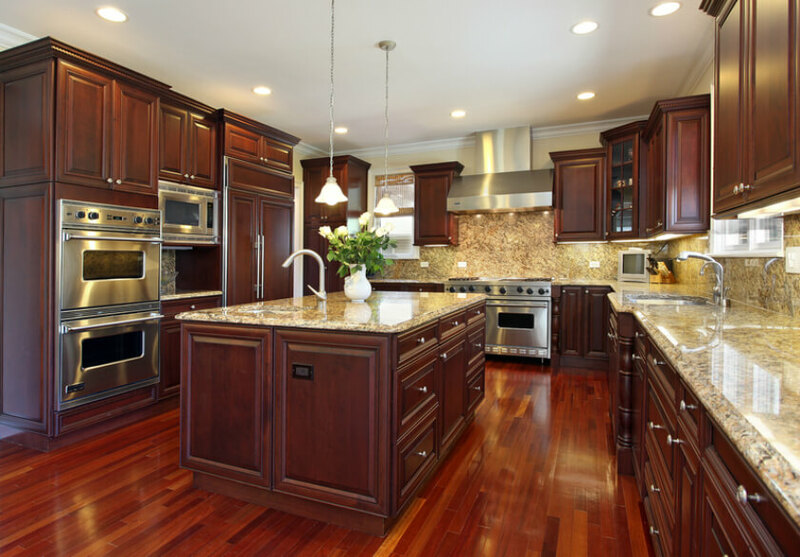 Different color than cabinets: If you have a white kitchen, consider a dark or honey wood island. The white and dark combination can be striking. Universal tone: Island top same color as the base. Alternatively, if you have a natural wood kitchen, get a white island. Also, as you see above and in our other island galleries, many islands themselves have contrasting color schemes such as white base and dark countertop or vice versa. The island is an opportunity to add design diversity in your kitchen. This applies to the countertop too. 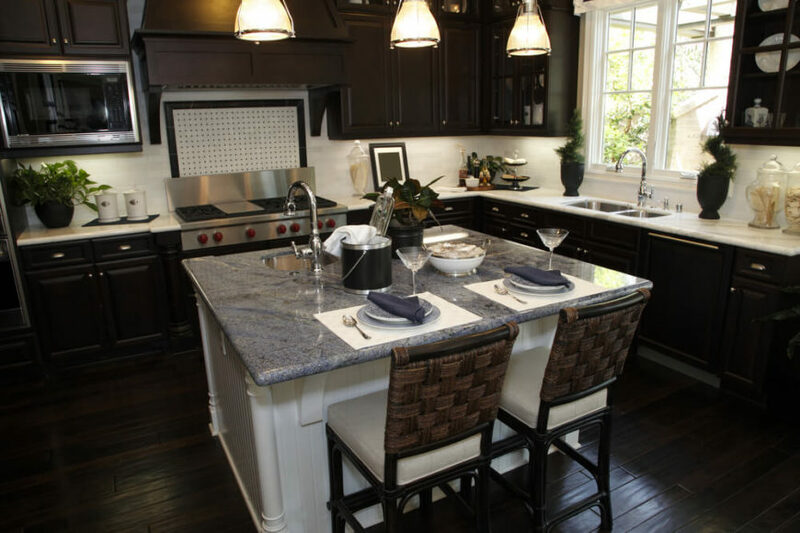 If you have granite throughout, you can certainly continue with granite on the island. However, why not consider something different such as wood for a large butcher block space or even stainless steel (there’s a reason commercial kitchens like stainless steel countertops – they’re incredibly durable and easy to clean). It’s no surprise islands are so popular. In fact, most new kitchens are designed to accommodate an island. They’re great because they offer more workspace, counter space, storage all without impeding flow too much (at least they impede less than peninsula assuming smart kitchen layout design). counter space: In my view, counter space is very, very important. When designing your kitchen, think carefully about counter space. Will the island be the main workspace or will the island have other features leaving more workspace on the regular counter areas? Storage: Most island bases offer a lot of additional storage. It sounds simple, but it’s not. You need to consider the type of storage you’ll want and access points. Will there be access points from all sides, 2 sides or one side? Will you have large open storage for pots and pans or smaller storage options such as layers of drawers? When planning kitchen storage, you must consider the kitchen as a whole. Seating: Kitchen islands are perfect for offering additional seating. Since people congregate in kitchens these days, it’s nice to offer stools or bar seats along an island or at the end of the island. TIP: Be sure to consider open space beneath for legs. I like the island bars with a 2-tiered section that overhangs so that there’s room for legs below the eating area without encroaching storage space. Production: Some islands include a sink and/or stove. This turns the island into a productivity area. I’ve had an island with a sink and it’s very, very handy. However, I’m not so keen about islands with a stove because the drop-down hood impedes the openness of the kitchen. You’ll definitely want to give some thought to your kitchen layout when incorporating an island. Why? Because an island can actually impede workflow. For example, if a you have the stove one one side of the kitchen and the sink on the opposite end of the kitchen with the island in between, you don’t enjoy the efficient triangle kitchen flow. Maintaining the kitchen triangle workflow is one reason islands include a stove or sink. By doing so, the efficient triangle workflow layout is retained. That said, you don’t necessarily need to place a sink or stove as part of the island. Many islands are set away from the main work space – essentially offering the function peninsulas do without closing off the kitchen. I think it’s safe to say most people prefer and island over a peninsula these days. 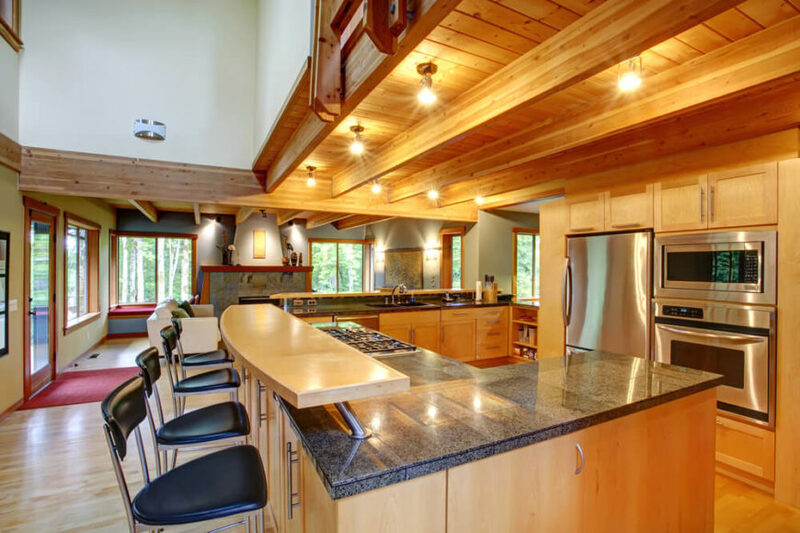 Islands offer a more open kitchen design and don’t impede access points. However, an island in the middle of a kitchen, if not well placed, can actually impede kitchen workflow whereas peninsulas seldom do because they make the triangle workflow easy to incorporate. Why not have an island and a peninsula? If you have a large enough kitchen space, you can create the typical U-shaped or G-shaped kitchen and place an island in the center. The best way is getting kitchen island ideas by scouring magazines, websites, and of course our epic kitchen island photo gallery. Also, if you’re planning on hiring a designer, ask for several design ideas. Keep looking until you find the perfect design for you and your home taking both aesthetics and function into account. 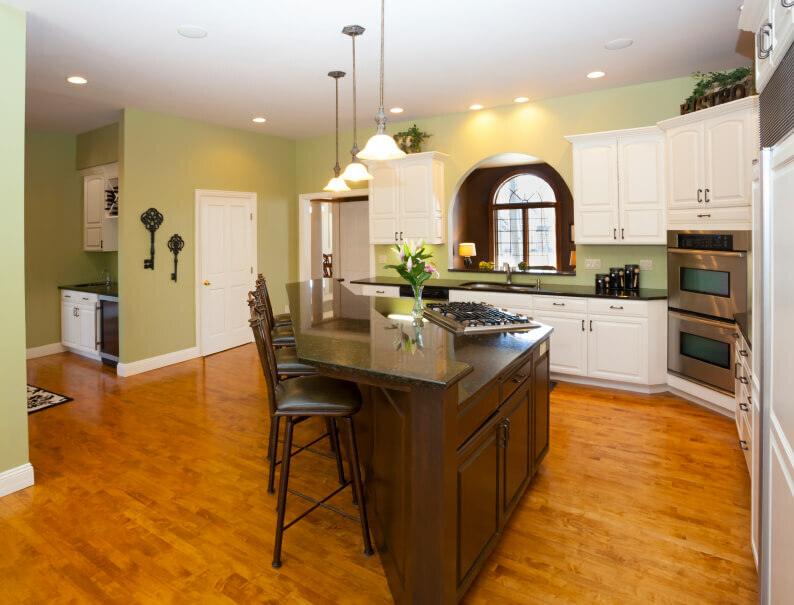 Buying an island for your kitchen is a significant home improvement decision. There are thousands of gorgeous pictures online that can make you want to jump on the next island you see, but careful consideration is necessary to find the best island to suit your needs. For instance, will you need a fully functional model complete with a stovetop and sink? 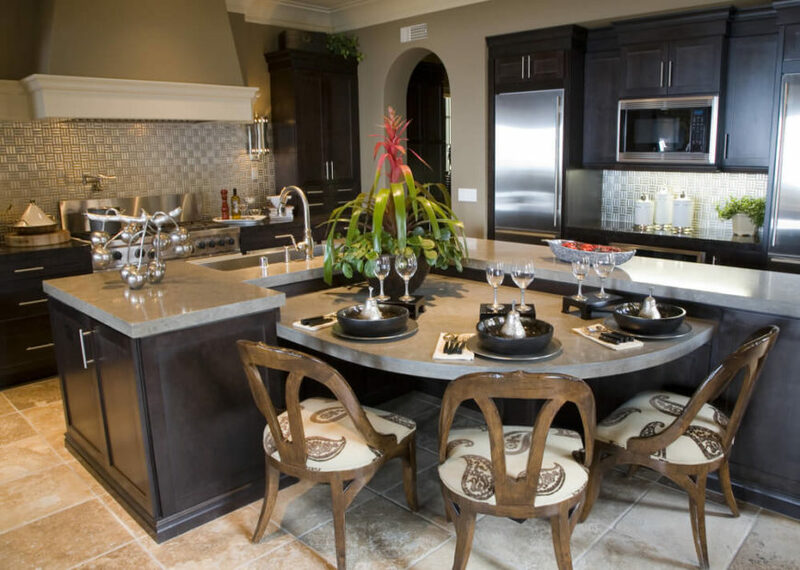 Would you benefit more from a double-tiered cooking station or a simple place to sit down and have a meal? Will you need to move your island or can it stay in one place? This buying guide will take you step-by-step through each aspect an island can contain to help you narrow down your selection and make the best buying decision. One of the first steps to take when considering types of kitchen island ideas is deciding which style of island would be the most beneficial to your home. 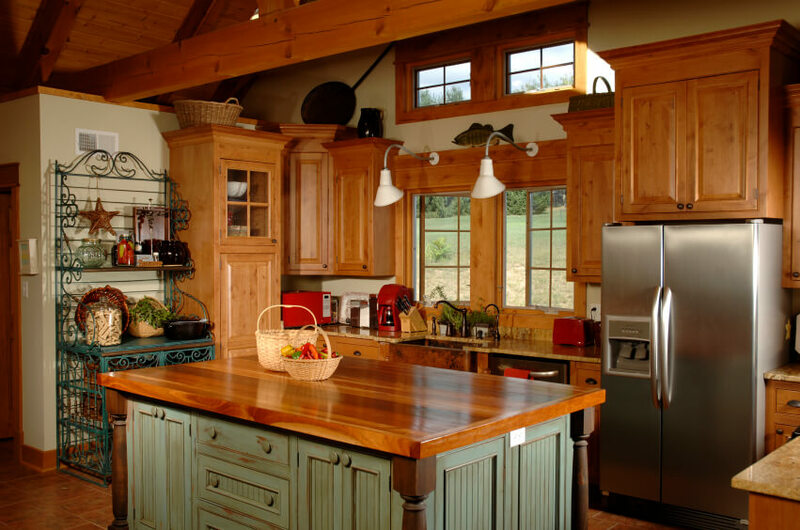 Styles such as rustic, country, or vintage are ultimately up to the existing style in your kitchen. Instead, consider the variety of models available, then pick one that suits the theme of your kitchen. Luckily, when it comes to popularity, there are no wrong choices in islands. This design takes the idea of an island and makes into a portable model with wheels, which is excellent for smaller kitchens that need to save on space. This also happens to be the budget-friendly option. Carts vary between two main styles; closed cabinets with kitchen drawers and open shelving. Either option provides the space necessary for storing cooking or serving items while still offering the space needed for food preparation. In most cases, you can find a cart that combines both styles. Make sure to pay attention to the size and types of storage offered. Some have wine racks and basket holders while others are merely kitchen cabinetry. This is a very similar option to the cart, but it does not have wheels at the bottom. They are still compact enough to save on space but offer a more traditional island look. While these models do not need to be installed, you can always do so if you wish. Commonly, these pieces have four corner supports from base to countertop and offer slightly more storage space than a cart. This is another incredibly simple and cost-effective option. At the core, these models are simply tables placed in the center of your kitchen. The difference is in the design. A table island might have an end piece with shelving or a flat surface near the bottom that stretches the length of the unit. At the same time, it could also look exactly like any other table as long as it matches the kitchen. These are usually best for creating a dining area inside of the kitchen or providing ample space to prepare meals. However, these models cannot be equipped with appliances and accessories. This type of island starts off the pre-fixed models. They consist of cabinetry that has a countertop material affixed to the top of base cabinets. Similar in design to the stationary models, the main difference in these units is their ability to be affixed with electrical appliances. They come in small designs that feature one cabinet with veneer in the back to larger sizes that make use of multiple cabinets on both the front and back sides. 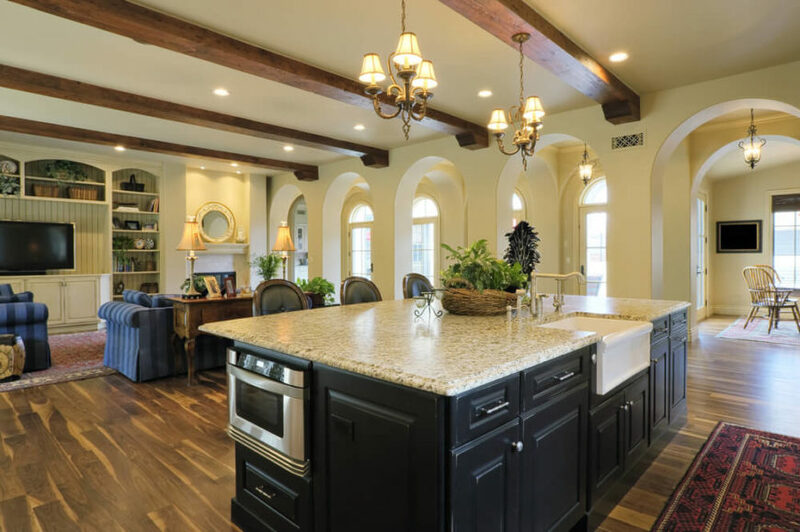 This type of island, as the name would suggest, connects to one of your kitchen walls. These are most commonly found in smaller kitchens that connect to other rooms where a standalone island would not make sense. The bar island could be made from any of the above models. The major separating factor lies in the overhanging countertop, which barstools can fit underneath. If that isn’t an option, choosing storage under the countertop that holds wine bottles and glasses, or any drink accessories of your choice will do the trick. Keep in mind that any of these styles can be, and often are, combined into one unit. A stationary might share features of a table and bar, while a cart might utilize both of the same. See dimensions for all island sizes here. 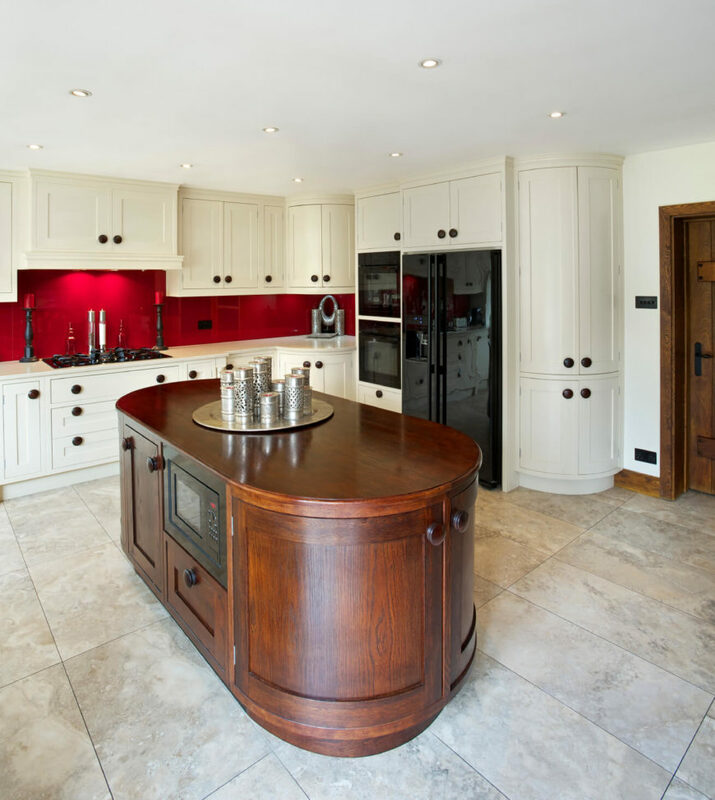 There are two different height models to consider for your island; single and double tier. Every picture shown so far has been a single-tier island. These consist of just one countertop and are the most common. The double-tier features one countertop raised above the other and can be utilized in almost any design. Their ability to separate spaces for different functions can come in handy with all types of kitchen island ideas. You could have a sink and food preparation area on the lower half while guests can enjoy their meals on the top half. Maybe you would enjoy a “bed and breakfast” style island where the grill is under and the eating area over, or even use the double-tier design to further replicate a bar-style feel. There are several materials that go into the creation of an island. None are explicitly better than the others, but each is worth considering. Your decision should reflect the design style of your kitchen. The most common material used is wood, since most cabinets and drawers are made from it. The major benefit of using wood for the underneath part of the island is that it can be painted or varnished to match your kitchen. 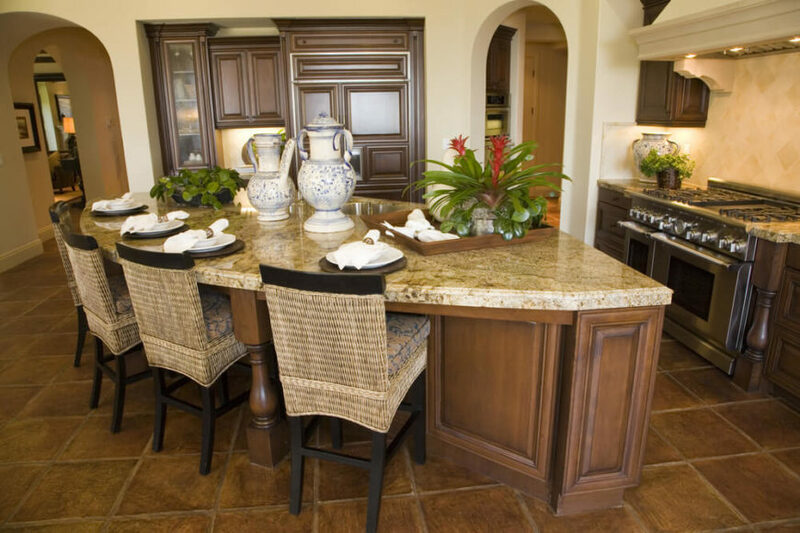 Much less common, stone requires that your island be permanently fixed to the floor. This is great for rustic or industrial style kitchens but leaves little space for cabinetry or any other accessories. This material is widely used in modern kitchen designs but mostly comes in just the table or cart styles. However, you can also find base cabinet models that make use of steel drawers. Any countertop material used in other parts of a kitchen may be utilized on your island as well. While granite remains the most popular, appearing in 42.59% of analyzed kitchens, there are plenty of options to choose from. See our epic guide setting out 18 types of kitchen countertops here. 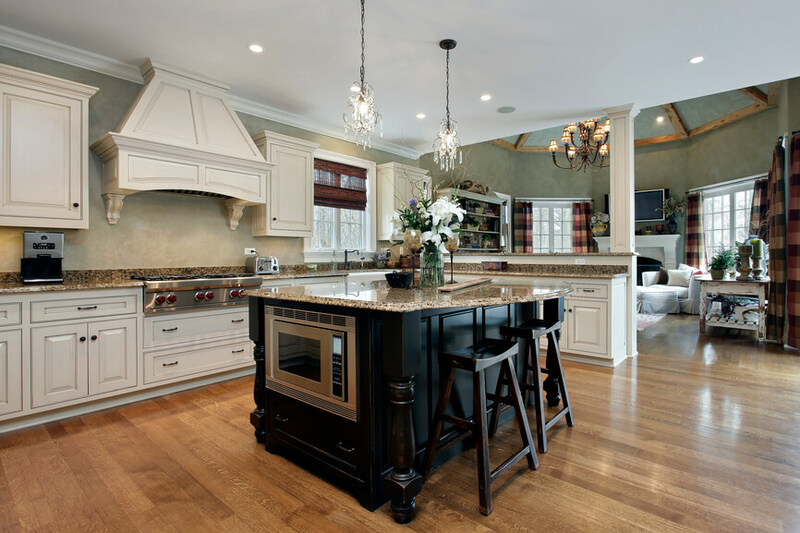 When it comes to various types of kitchen island ideas, appliances almost always come to mind. Should your island have any? Would they benefit your kitchen? Consider these additions as either pre-installed options or add-ons. Having an extra sink as part of your island is a great way to wash produce, clean utensils, or even wash your hands while preparing food. It can also serve as a second dishwashing station if your kitchen does not feature a dishwasher. These are excellent choices for an island that will be used primarily for cooking. Many kitchen remodels place the range on an island to save counter space elsewhere. Since all the wiring is held underneath, hidden from view, you can choose between any fuel type you would like. Keep in mind that a cooking range needs proper ventilation. Most pre-built sets come with a matching hood for over your range, but don’t be afraid to mix and match to suit your design style. Opting to place an additional oven, or replacing your old one, with a newer model inside of your island is a great way make preparing food in your kitchen easier. You can usually install an oven-stove top combo, but having a separate unit installed looks just as nice. 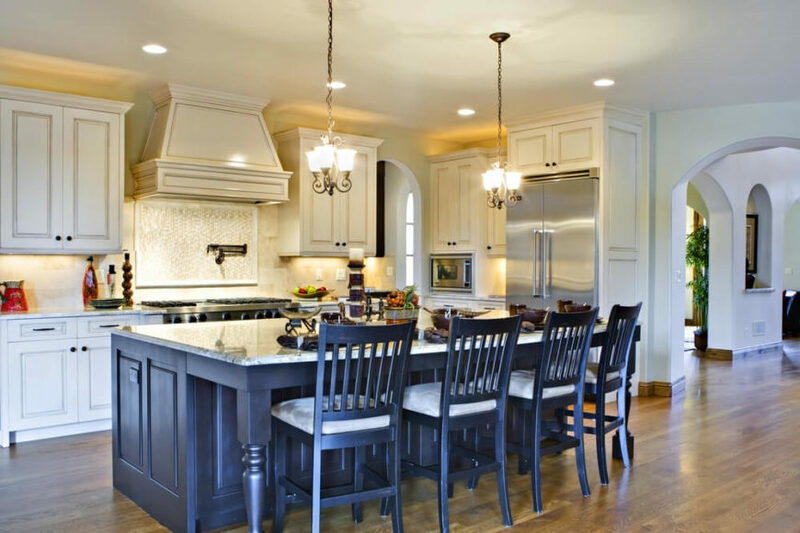 Depending on the lighting in your kitchen, you might want to choose an overhead light for the island. You can choose from a single hanging light or multiple, as well as bright or dim. These days, most interior designers suspend pendant lights (1 to multiple) above the island. The pendants are in addition to recessed lighting peppered throughout the kitchen. While they are usually not necessary, as kitchens already have ample lighting, they can easily bring out the best of any design style from modern to vintage and everything in-between. Last, but not least, is the dishwasher. This is an excellent choice if your kitchen does not already have one of these handy appliances. Some people even choose to have multiple to accommodate the mess a large gathering creates. Depending on what you plan to use your island for, you may want to consider a few accessories that will make it more useful. For instance, an extra cooking space that does not feature a vent for the range might make use of a hanging pot and pan holder. Outlets for other utilities or charging phones can be beneficial to any area, as can a switch for hanging lights above the island. Consider how your island will be used, then think about which accessories would make your time in the kitchen more enjoyable. After you’ve sorted out a few types of kitchen island idea, the next step is to view what models are available. You can do this through various online retailers as well as storefronts. When it comes to online shopping, there are two major retailers that make the buying process simple. Well known and trusted around the world, Amazon offers island models from a wide variety of retailers. Their rating system lets you know what owners of the furniture think, which helps you to avoid poorly crafted islands. This is also a great place to pick up any add-ons you would like to include on your island. However, most options require a DIY project or come as non-fixed models. This another excellent online option for various types of kitchen island ideas from carts to base cabinets. Wayfair specializes in home furniture and décor, featuring products from dozens of vendors. They offer everything from carts to tables and even a few base cabinet models. Wayfair offers free shipping on items over $49 as well as closeout sales. While each of the following options also has an online counterpart, their brick and mortar stores offer an incredibly fun experience when shopping for islands. The kitchen department at Home Depot offers several displays that help you experience what different types of kitchen island ideas would feel like in your home. Their islands can be purchased separately, or bought in an entire kitchen remodel set. Lowes offers the same experience as Home Depot, but with different types of kitchen island ideas from different companies. Whichever store you choose, this is where you will find the more luxurious peninsulas and base cabinet models that come pre-equipped with appliances and features. If you’re on a tighter budget, they offer several wallet-friendly models as well that still features excellent craftsmanship. The benefit to these stores is that they also offer installation if necessary. Most people opt for hiring a kitchen cabinet builder and designer to design, build and install an island. Most towns and cities have several services to choose from. It’s merely a matter of checking out local services and choosing one that hopefully does a good job. It is difficult to put an exact price tag on any one style island. Each type of kitchen island idea has its own features that can raise or lower the cost. A simple cart may cost as little as $120, while a more elaborate rolling butcher block-top can cost upwards of $1,600. Appliances and additional features like wine racks or bookcase ends will, of course, increase the final cost. 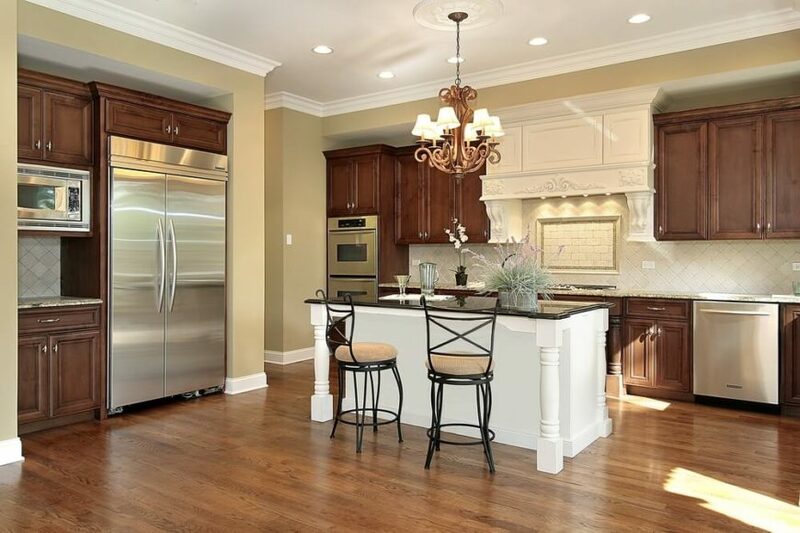 Many opt to remodel their entire kitchen, which costs an average of $40,000. The price of the island itself after installation on average, as part of the remodel, is roughly $5,778. This is including appliances. Staying within your budget can be tricky, especially with the temptation of additional features. Making sure to identify what purpose your island will serve can help keep you from spending more than you need to. Speaking of storage, this kitchen island has it in abundance. The sleek curved wood design of the extension allows for a pair of massive drawers, while the main body houses a dual-basin sink and expansive countertop space in jet black. 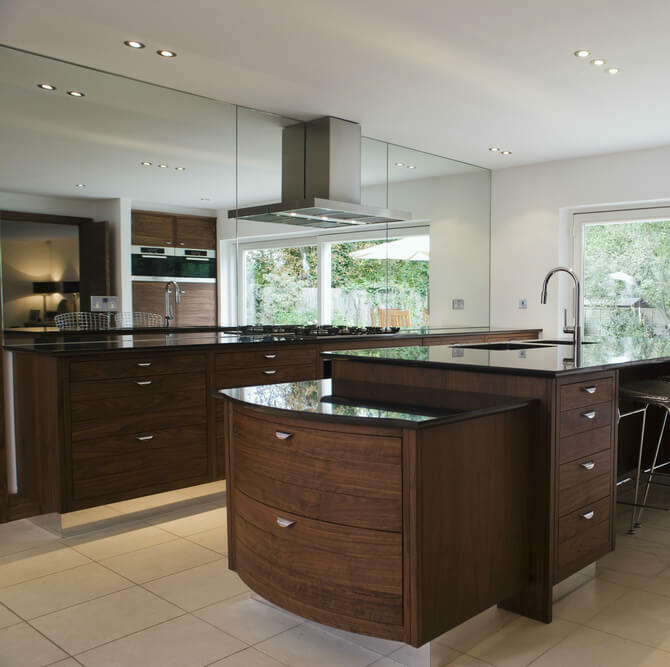 Learn more about this glossy modern kitchen in our extensive review. This extraordinary kitchen island grants a burst of contrast to its respective room, with a dark stained wood structure and bright marble countertop. 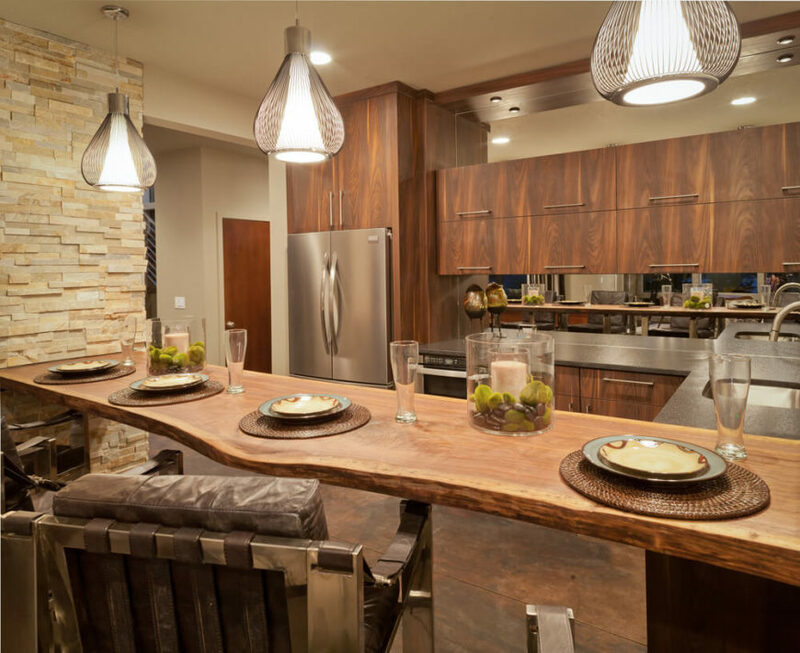 The extended countertop space allows for in-kitchen dining, with a set of matching wood bar stools tucked in. Despite its more rare appearance, hardwood countertops are one of the best options available for both style and utility, when it comes to designing a kitchen island. This example features a rustic-styled base with old fashioned cabinetry painted hazy green, contrasting with the sleek, rich stained wood countertop. Within this sprawling, open-plan kitchen, the island stands in sharp contrast, flaunting a black stained wood construction and beige granite countertop. 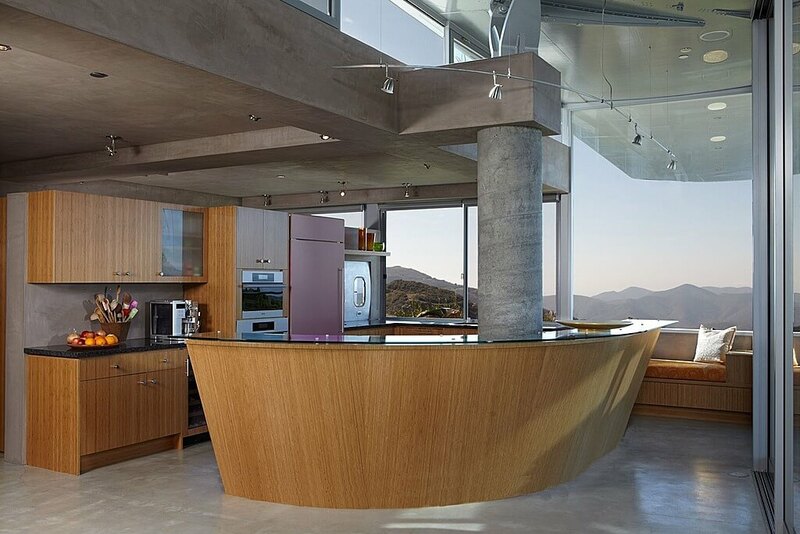 The island houses a stainless steel microwave, in addition to a curved expanse of countertop that provides ample dining space for a pair of wood bar stools. With this kitchen, we’ve reached one of the more unique island designs: the diamond shape. These work well in larger, open kitchens are shared room designs, helping to separate the kitchen itself while offering a surfeit of usable countertop space. This two-tier design boasts abundant cabinetry, a built-in range, and a lengthy in-kitchen dining space. With an expansive open plan space, shared with a living room, this kitchen has room to spare. The extraordinarily large island in black stained wood houses a variety of drawers and cupboards, plus a small over, in the body. An oversized white basin sink is built into the light granite countertop, while the structure extends into a broad space for in-kitchen dining on the opposite side. Click here for more islands with a sink. In this bright and modern kitchen, we see a unique take on island design. The L-shaped island stands out with a built-in sink and abundant storage, plus an attached high dining table. The serpentine design helps define the kitchen space while enhancing the bold white color palette. 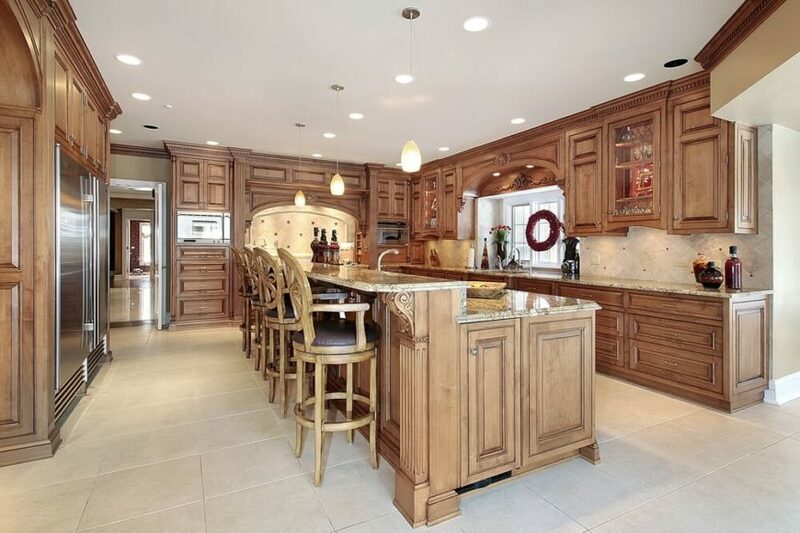 In a richly appointed, traditionally styled dark wood kitchen, a matching island commands attention at center. Featuring a broad dark marble countertop and built-in sink, the island also houses cabinetry and a glass door wine rack. The end of the countertop extends to offer dining space for a pair of leather upholstered, nailhead trimmed bar stools. Here’s a unique open-plan design, incorporating a slim kitchen and large living room. The island is used, along with different flooring materials, to define the spaces. A light hardwood countertop and lower dining tier provide ample space, while the white body matches the surrounding bright cabinetry. A built-in range sits beneath a detailed central hood vent, extended from the ceiling. In this dark hued, utterly bespoke kitchen, sharp contrast is achieved via juxtaposing between dark floor tiling and matching-toned granite countertops against rich wood cabinetry. The island features glass door cabinetry and a two-tier design, with an upper level in rich wood for dining purposes. The bright and bold nature of this kitchen is highlighted by warm hardwood flooring and rustic white painted cabinetry. 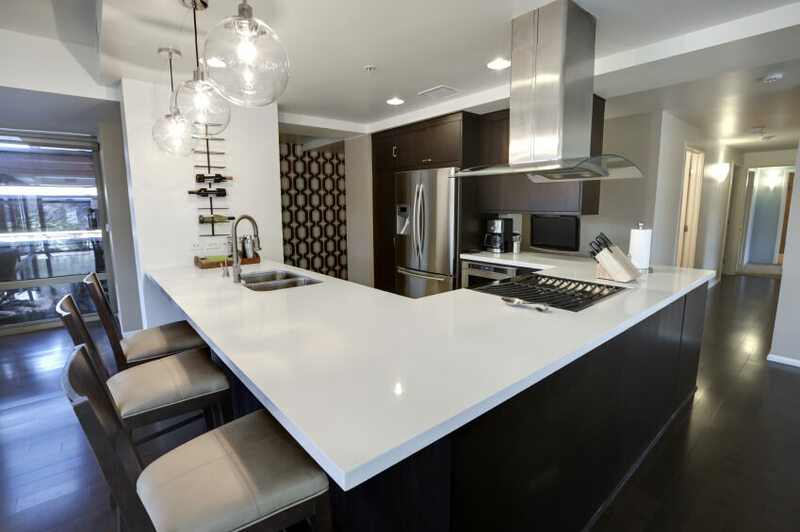 The wide space centers on a beautiful island with glass panel cabinetry and sleek, dark toned countertop space. 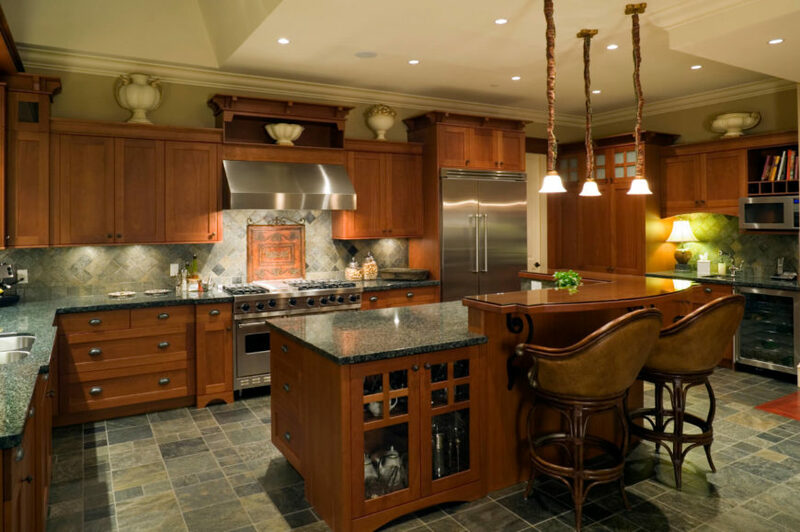 This ultra-luxurious kitchen flaunts rich cherry wood from floor to ceiling, with ornate cabinetry all around. Beige granite countertops add a splash of contrast and brightness, which continues on the island surface. With a built-in sink and array of storage drawers, the island is a highly functional center of this kitchen. In an ultra-modern home with a wide open-plan design, the kitchen is clearly defined by the immense, curved white island at center. 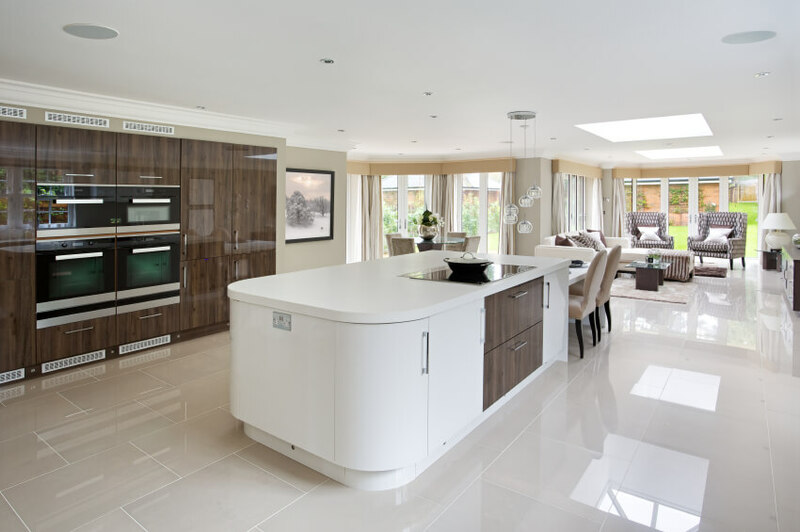 Boasting a high contrast section of natural wood cabinetry, matching the surrounding floor to ceiling cupboards, the island houses a smooth surface range and a dining table extension. In a luxuriously detailed kitchen, high contrast informs the overall style. 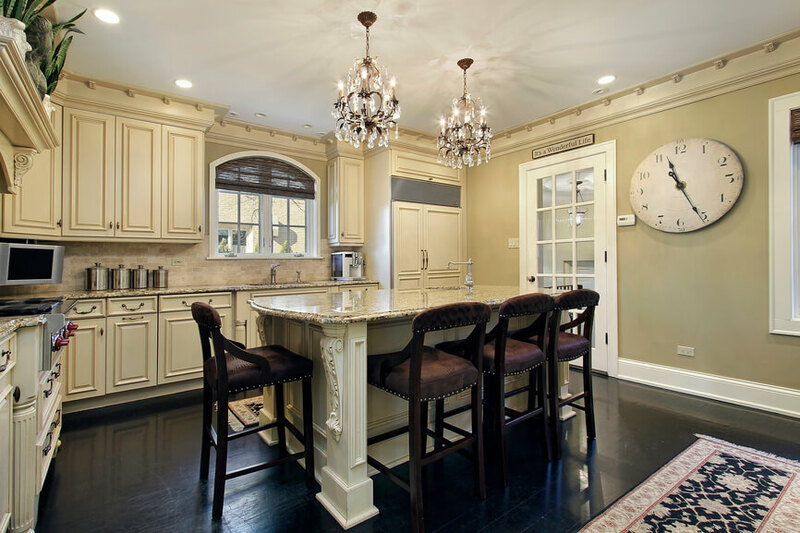 Dark hardwood flooring matches light beige cabinetry, while the granite topped island features ornate carved detail and abundant room for in-kitchen dining, courtesy of a set of leather upholstered bar stools. The warm hardwood flooring and white cabinetry of this broadly open kitchen design make an enticing, bright space. 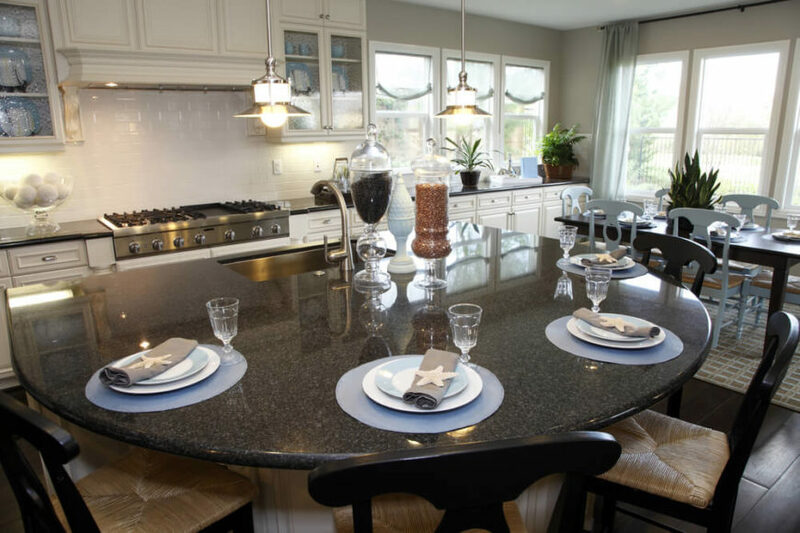 The large island in black with light granite countertops stands in stark contrast as a centerpiece element. With a raised tier for dining, and side structure for shelving storage and additional countertop space, it makes the most of its large footprint. This ultra-modern kitchen shrugs off the usual buttoned-down look of its contemporaries with flashes of bright color throughout. The island features an expansive dark countertop with dining space, plus a tall wine rack and cooled storage rising above. This extra feature backs up a built-in range, with stainless steel hood vent overhead. 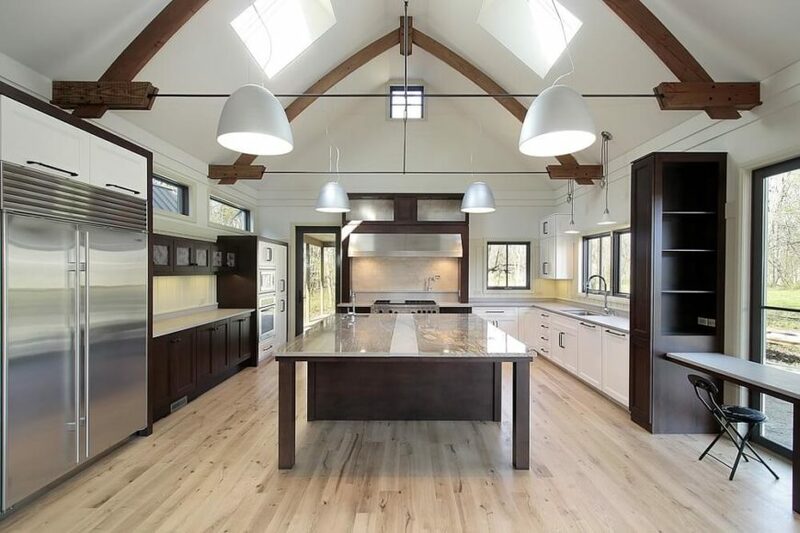 This bright kitchen stands below a massive vaulted ceiling with exposed natural wood beams, centered on a massive island with a full-size dining table extension for 3-sided eating (see more kitchen islands with seating here). The glass surface shows off the rich wood construction, which contrasts with the lighter hardwood flooring and white cabinetry throughout the kitchen. Now we come to another luxuriously appointed kitchen, bright and bold with white cabinetry and light marble flooring. The wide expanse is punctuated by the rich, dark wood two-tiered island, housing a large wine rack and plenty of in-kitchen dining space on the granite countertop. 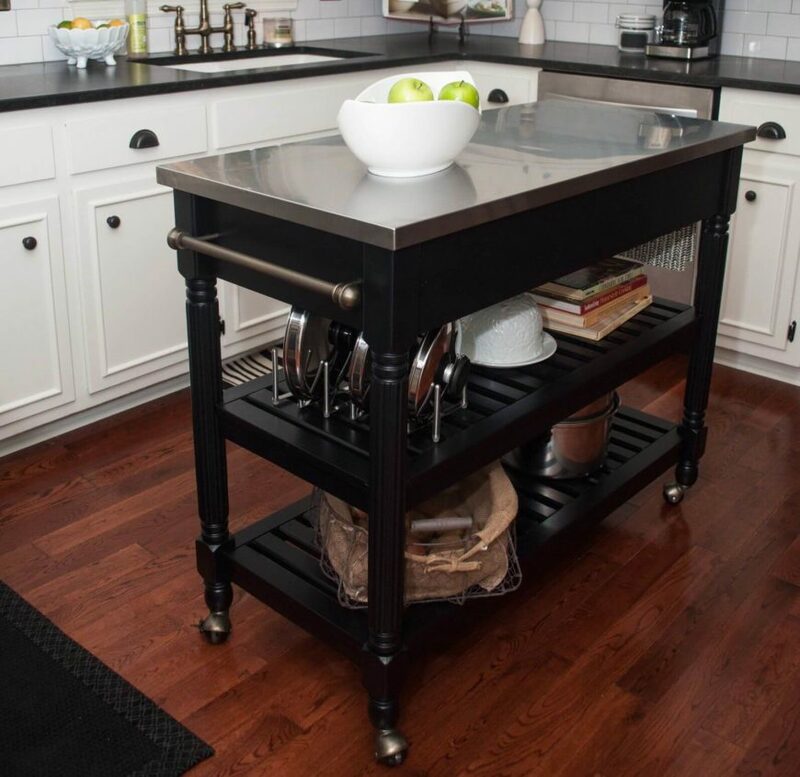 If you don’t have a $10,000 budget, check out this DIY kitchen island with wine rack. While it’s connected to a free standing dividing wall, we’ll still count this unique creation as a kitchen island. A single large slab of natural carved wood makes for abundant in-kitchen dining space, while helping define the natural wood kitchen itself. This subtly bespoke kitchen features a standout L-shaped island in dark stained wood, with a soft grey marble countertop. There’s a large curved dining table built into the center of the frame, with room for a trio of seats. With a built-in sink and abundant storage, this is an exceptionally useful island design. This sleekly contemporary kitchen sports dark hardwood flooring and cabinetry tones to match, with a massive L-shaped island defining the entire space. Glossy white countertops add a wealth of contrast and brightness, housing both a sink and large gas range. Curved cabinetry is the defining feature of this modern kitchen, reflected on the abundant white cabinetry and the natural wood island alike. With large format grey tile flooring and a burst of red, courtesy of the backsplash, the kitchen is flush with textural detail. The island itself is a unique oval shape, with built-in microwave and plentiful storage. This novel design is a broad, angular kitchen island with a large swath of dining space and built-in sink on the beige granite countertop. Rich natural wood construction matches the surrounding cabinetry, meshing well with the brown tile flooring. 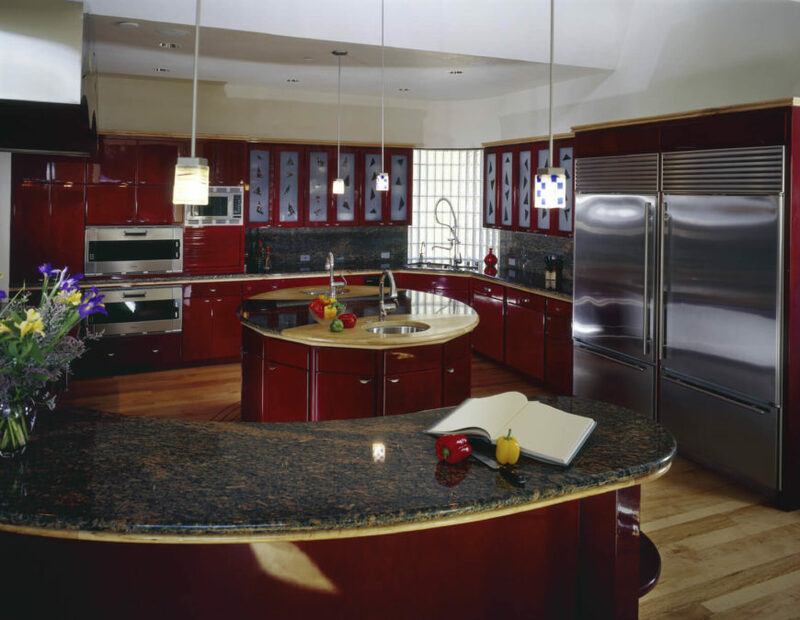 In a modern kitchen flush with bold red cabinetry, an innovative circular island holds the center. Wrapped in the same cherry red tone as the rest of the kitchen, the island sports a unique countertop, pairing granite with light wood. A set of dual sinks and wraparound cabinetry provide a surprising amount of utility in a small package. 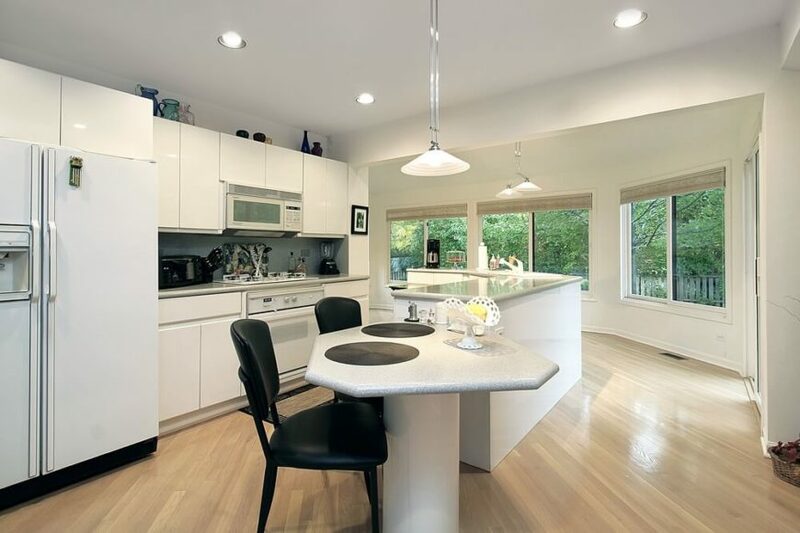 Here we see another sprawling open-design kitchen, this time in pristine whites over a dark hardwood floor. The island is a massive semi-circle design, with large basin sink on the flat end and a large curved space for in-kitchen dining. Dark granite countertop adds to the bold contrast in this brightly sunlit room. This kitchen balances its dark wood flooring and cabinetry with white marble countertops and matching tile backsplash, while the island truly punctuates the contrast. With white wood construction and grey granite countertop, the island features both a built-in sink and space for two diners. With a modern rustic look and open-plan design, this kitchen is absolutely awash in rich natural wood tones, from floor to ceiling. Exposed wood beams match the cabinetry and hardwood flooring, while the L-shaped island itself boasts an upper level dining tier of light wood. The large granite countertop includes room for a gas range and plenty of work space. In an open but traditionally appointed kitchen wrapped in natural wood cabinetry, the elegant white island at center draws attention while subtly reflecting the white tile backsplash. In contrast with the hardwood flooring and beige granite countertops, a black countertop on the island truly punctuates the scene. Our final kitchen island design is a unique take on the entire concept, with a slim frame and casters built into the legs for portability. This allows for dynamic placement and extraordinary utility. The black wood frame and stainless steel countertop make for a very sharp, modern appearance in this kitchen with hardwood flooring and white cabinetry. See more kitchen islands on wheels here.